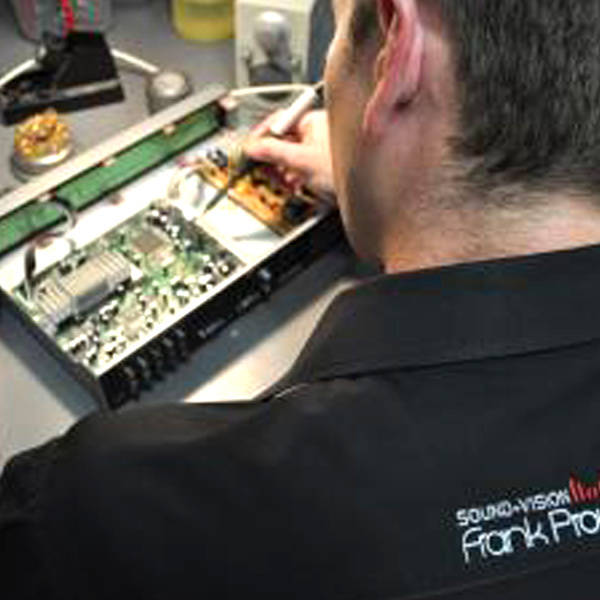 At Frank Prowse Hi-Fi in Perth, we sell industry award-winning and world-renowned audio-visual gear which is manufactured for quality and created for enjoyment. However, as with anything, your hi-fi systems aren’t immune to damage or unforeseen faults from wear and tear – and our speakers and systems are generally subjected to continual use and constant enjoyment! We provide hi-fi repairs in Perth, including audio-visual and home theatre repairs. We repair projectors, speakers, amplifiers and more. Depending on the size of the piece of equipment and your preferences, you can bring it into us for inspection and repair *. We will do our utmost to repair any item we’ve sold you, and if we can’t, of course we will assist in choosing a new item. Because let’s face it, kids break things, pipes in the ceiling burst, leaks happen, teenagers can be rough – homes are to be lived in! Can’t be fixed? Or simply time for an upgrade anyway? There is an initial inspection fee per unit ($99 for audio/visual equipment, $130 for projectors), which will come off your repair invoice should you choose to proceed with any repair. * Due to space limitations in our showroom, all repairs and thorough inspections are now performed off-site. This in no-way slows downs/prolongs the process and all units can still be dropped off to our showroom. PLEASE NOTE THAT DUE TO A REDUCTION IN RELIABLE TECHNICIANS, OUR EXISTING TECHNICIANS NOW HAVE INCREASED WORKLOAD. COUPLED TO THIS THE TIMEFRAMES INVOLVED IN SOURCING PARTS AND OBTAINING PRICE AND AVAILABILITY BEFORE THEY CAN SUBMIT THEIR REPORT, WE ARE WORKING ON ABOUT 3 WEEKS BEFORE WE CAN POSSIBLY RECEIVE A TECHNICIAN’S REPORT ON ANY ITEMS DROPPED IN FOR EVALUATION. WE APPRECIATE YOUR UNDERSTANDING IN THE EVENT OF BLOWN-OUT TIMEFRAMES.